Submitted Photo The Pete Ciraolo All-Star Big Band will perform an outdoor concert at the Collins Library on Friday, July 20 at 7 p.m. This performance will be in the parking lot of the library under a tent with seating. COLLINS — The Pete Ciraolo All-Star Big Band will perform an outdoor concert at the Collins Library on Friday, July 20 at 7 p.m. This performance will be in the parking lot of the library under a tent with seating. But be sure to bring your dancing shoes! 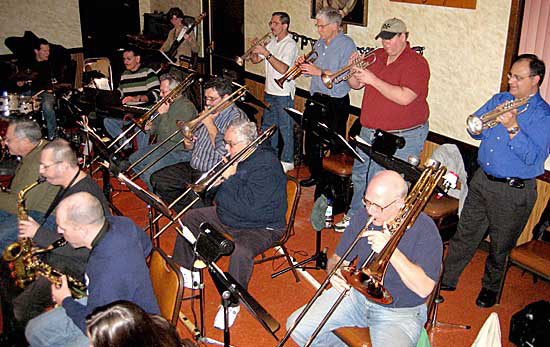 This event will feature an 18-piece big band performing favorite swing and big band hits. The concerts are out of this world. These talented performers are the best local players and music educators in the area. If you love legendary classics played with amazing energy and expertise, this is the performance for you. Read more about the Pete Ciraolo All-Star Big Band by visiting its web site www.PCBigBand.com. The performers include: Pete Ciraolo as leader, conductor and trumpeter; John Anderson on drums; Laura Anderson on Baritone; Dr. Joe Baudo on keyboards; Alan Braunstein on Trombone; Kelly Bucheger on Alto; Ray Chanberlain on Bass Guitar; Vic Chioda on Tenor Sax and Alto Sax; Adam Desmond on Alto Sax; Chris Hooton on Trumpet and Flugelhorn; Mike Ihde on Tenor Sax; Jayd Mollnar on Trumpet and Flugelhorn; Phil Nyhuis on Trumpet and Flugelhorn; Joe Parisi on Trumpet and Flugelhorn; Steve Parisi on Guitar; Andrew Peruzzini on Trombone; Bob Reichard on Trombone; and Fred Secor on Bass Trombone. The Collins Public Library sponsors this event, which is part of the Music in the Library Series. All concerts are free and open to the public, although donations are gratefully accepted. There will be parking available in the library parking lot. Additional parking will be at the Painter Center and at the Collins Town Hall. For more information, call the Collins Public Library at 532-5129.